China recently landed the first space mission ever, called Chang'e 4, on the far side of the moon. The mission's landing spacecraft and Yutu-2 rover were sent to probe the moon's geology, seek out water, study the night sky, and even grow silkworms on the lunar surface. Both spacecraft recently woke up from a "noon nap" to survive searing-hot temperatures. The lander took a 360-degree, wrap-around picture of the landing site after waking up on Friday. 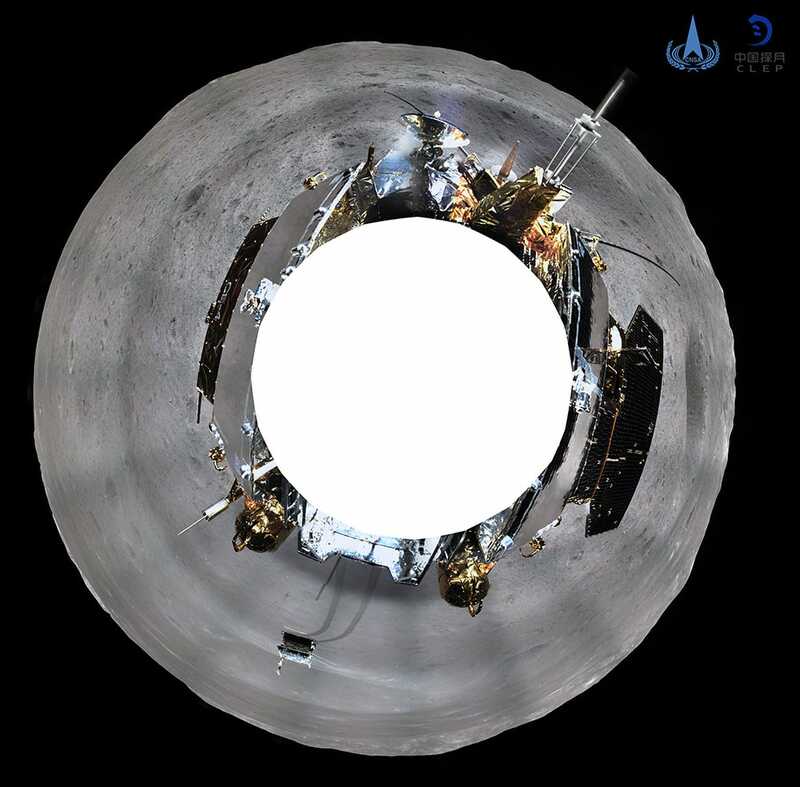 China has released a detailed panoramic image taken by the first-ever spacecraft to land on the half of the moon we can't see from Earth. The mission, called Chang'e 4, touched down on the moon's far side ("dark side" is a misnomer) on January 3. The car-size lander and a desk-size rover it deployed, called Yutu-2, are designed to probe the region over the next six months. Shortly after the lander and rover began their work, however, the China National Space Administration put the two spacecraft into a planned three-day "nap," as Space News reported. This helped the mission survive the equivalent of high noon on the moon, during which time lunar surface temperatures can exceed a scorching 240 degrees Fahrenheit — a risk for overheating and damaging spacecraft. The noon nap ended on Thursday and both spacecraft "were in stable condition," the CNSA said on its website, allowing the Chang'e 4 mission to resume in earnest. The picture at the top of this story is known as an orthographic projection. This stretches some parts of a panorama and shrinks others to create a single, fish-eye-lens-like image. The horizontal image above is a cylinder projection, which is essentially a 360-degree, wrap-around image cut at one point and flattened. The cylinder projection was the most detailed of the image pictures released by China and shows the topography of the landscape. It's also clearest image yet of the desk-size Yutu-2 rover, which is traipsing across the lunar surface near the edge of a small crater. Earlier on its mission, the lander sent back the first photos from the surface of the moon's far side, and the images show Yutu-2 along with the tracks left by its six wheels. Scientists in China hope to use the Chang'e 4 mission to learn vital clues about the moon's formation, scout for water ice, scan the night sky for radio signals, and even grow silkworms in a self-contained ecosystem. The mission is exploring a larger impact site called Von Kármán crater, which stretches about 111 miles in diameter. The crater is located inside a feature called the South Pole-Aitken Basin. The basin is thought to be the site of a cataclysmic impact with the moon some 3.9 billion years ago, where deep-down material splattered and remains on the lunar surface for study. "It's possible this basin is so deep that it contains material from the moon's inner mantle," Tamela Maciel, an astrophysicist and communications manager at the National Space Center in Leicester, England, tweeted after the mission's launch on December 7. 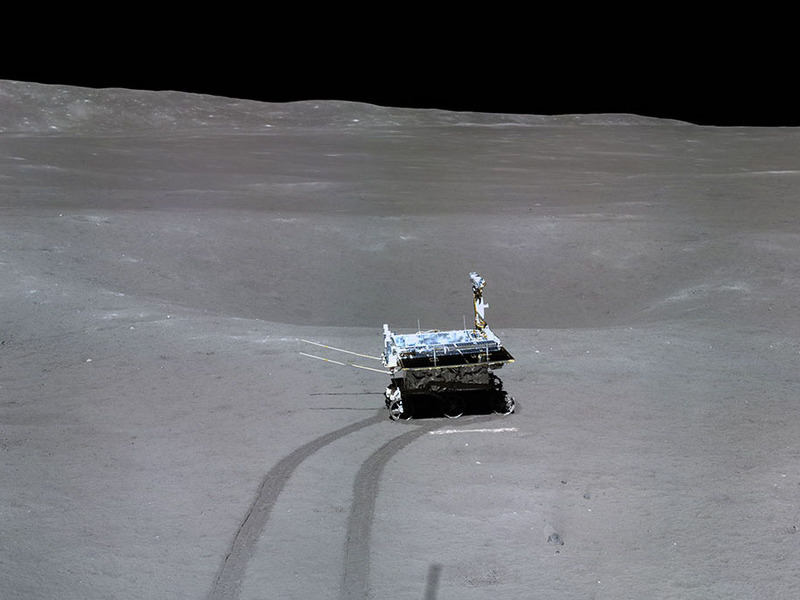 "By landing on the far side for the first time, the Chang'e-4 lander and rover will help us understand so much more about the moon's formation and history." The mission will again have to take a nap around January 21, when there is a full moon and lunar eclipse (colorfully known as a "super blood wolf moon") on the near side facing Earth. This means the far side will be completely dark and temperatures may dip to -290 degrees Fahrenheit, creating another danger for the spacecraft to survive. The name "Chang'e" in the mission's name is that of a mythical lunar goddess, and the "4" indicates that this is the fourth robotic mission in China's decade-long lunar space exploration program. 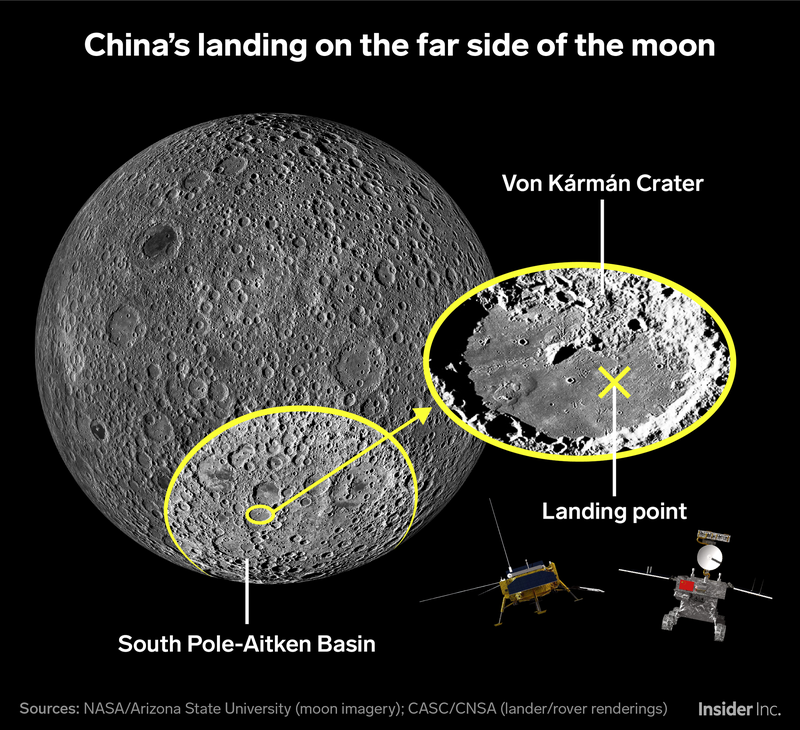 No country or space agency, including NASA and Russia, had ever made a soft landing on the far side of the moon until Chang'e 4 on January 3.